you can see the lights from the city lighting up the sky to the left and the auroura lights lighting up to the right. Message edited by author 2006-11-08 12:11:53. If the horizon was very neat the bottom of the frame, it might have been better. Excellent subject and awesome composition. a great shot, but i feel that the long streak of reflective light is a little distracting. beautiful colours though. Very lovely! 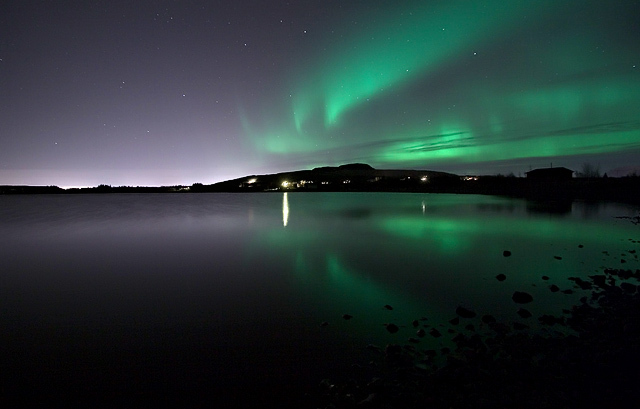 The borealis is stunning in this photo. beautiful ! i wish i was there at that moment! Great place you live! Beautiful Aroura shot.Love the reflection in the water. Every time I see one of these photos, I can't help but gasp at the beauty! How lucky you are to have this amazing photo opportunity! And this one is particularly well done! i like how you pulled out and showed the surroundings and scale. Nice capture but the bright light from the distant shore is a distraction. Proudly hosted by Sargasso Networks. Current Server Time: 04/23/2019 07:53:54 AM EDT.